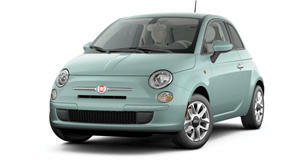 Fiat North America is reporting that sales of their new 500 small hatch have not only been very successful so far, but are also exceeding expectations in states such as Texas. And as an added surprise, many buyers are ordering their 500s with a manual transmission. When the Fiat 500 initially made its debut in the US, Texas was not one of the state&apos;s anyone would have expected to be a large market for the Italian brand. In the state where real life and sports Cowboys are usually pictured driving big manly Chevrolet Silverado&apos;s or Ford F-150&apos;s, the Fiat 500 has proven to be a sales success. According to a recent report, more Fiat dealers are placing orders for the car with a manual transmission, surprising since most Americans prefer automatics. According to the company&apos;s North American boss, a possible reason why the 500 has been doing so well in the Lone Star state could be due to the green hi-tech residents of Houston, one of the largest cities in the US. Another reason why the 500 has been so successful in the US market, particularly in Texas, is because it&apos;s affordable and extremely fuel efficient, partly due to the manual transmission. Ironically enough, the residents of the "oil state" have opted to take a more eco-friendly approach which has left even Fiat executives baffled.